Are these animals too 'ugly' to be saved? An Australian naturalist has photographed a rare, nocturnal parrot that has not been caught alive for more than 100 years. Bird-watcher John Young also videoed and recorded the sound of the parrot - known as the Pezoporus occidentalis. But he said he would rather go to prison than reveal where he found the green and yellow bird. He does not want the remote desert site, in Lake Eyre basin in Queensland, over-run with other bird-watchers. 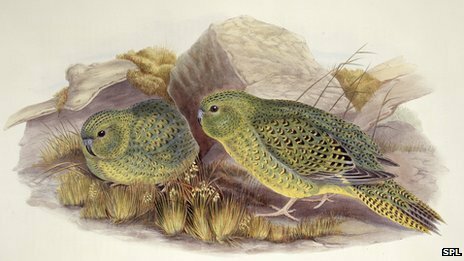 Scientists know little about the night parrot - dubbed one of the world's most mysterious birds. There have been a number of expeditions to track it down over the years but many, including one to Lake Disappointment in Western Australia, have ended in failure. There have been several unconfirmed sightings over the last 100 years - and two have been found dead - but many feared the bird was on the brink of extinction. Now Mr Young, who describes himself as the wild detective finding nature's secrets, has come up with what he says is proof that the parrot is still alive. Many experts appear to agree. Dr Leo Joseph, the director of the Australian National Wildlife Collection, told the BBC: "He has taken magazine cover-quality photographs. They really couldn't be anything else - if they are a forgery, they are stunning." The shy parrot has captivated the interest of ornithologists, partly because it is so rare. There could be fewer than 250 in the Australian wild. Their number has thought to have declined because they have been hunted by feral cats and foxes, and because of a loss of their habit to farming. Mr Young has told the authorities where he saw the night parrot, but is not going to publicly release the information. "The last thing I want to see is hundreds of people out there with night lights," he is reported to have told a special event organised in Brisbane to announce his findings. Dr Joseph, who was in the audience to hear of Mr Young's find, said this discovery could galvanise interest in Australia's endangered wildlife.